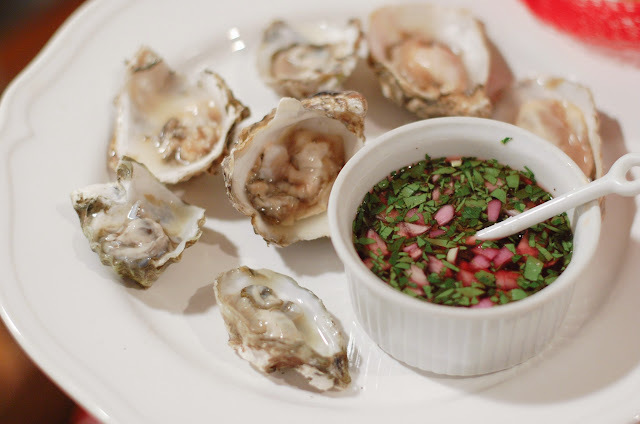 Freshly shucked oysters are just the best....even better with a little mignonette. 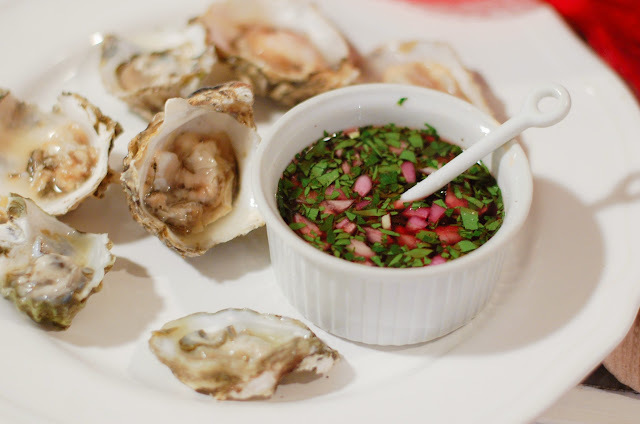 A mignonette sauce means "cracked pepper" and is usually used to top raw oysters on the half shell. There are many different varieties, but the classic uses red wine vinegar and minced shallots with of course freshly cracked pepper. This is a version of the classic, but with finely diced cool cucumbers and a bit of chopped parsley mainly for color. Try this out at home with a dozen oysters from your local market. Also, if you need some assistance in shucking, check out this video on my Oysters Rockefeller post. I'm used to making this in large batches for oyster bar events for my company, Denver-based Seattle Fish Company so I've had to scale down the measurements. Luckily this saves for quite awhile since the main ingredient is vinegar. 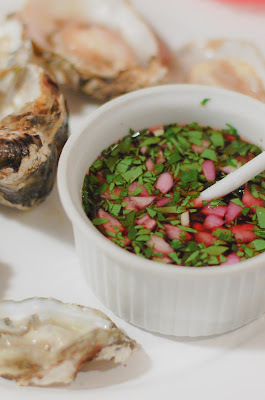 Also, the shallot ratio may seem like a lot, but it really gives the mignonette it's flavor and can be opted out when you scoop some on your oyster. Where to buy oysters? My favorite are from Chefs Fresh Fish - you can buy them buy the dozen online, overnight shipped to your house the next morning. There isn't much to this recipe other than a bit of chopping and mincing. The trickiest part is the cucumber. I use a potato peeler to remove the skin and then I halve the cucumber length-wise. Using a small spoon or melon scooper, scoop the seeds out of the flesh and discard. Cut the cucumber into matchsticks and then dice into small cubes. 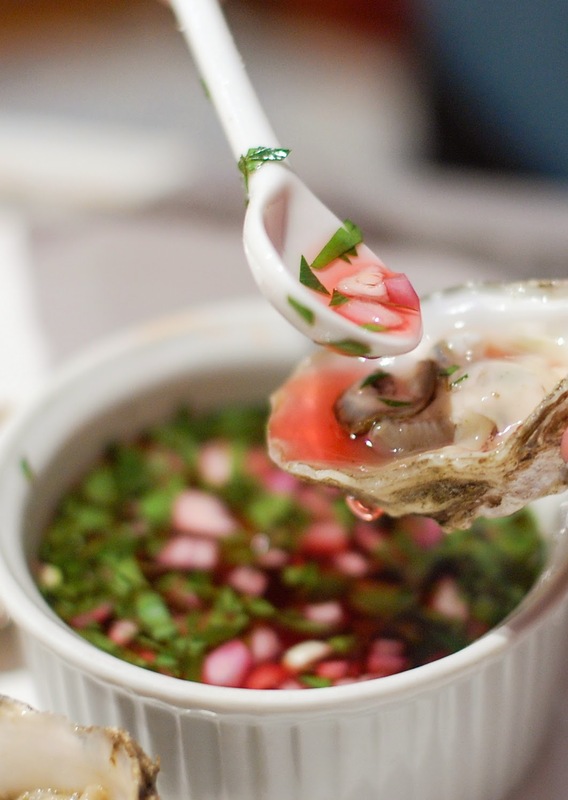 Mix the other ingredients together and serve with freshly shucked oysters! it's looks so gooddddddddddddd!!! i love itttttttttttttttt!!!! honey would you like to folow each other on our blog?? i can t wait your next article. kisses from italy.